The spectacular Beit Guvrin caves are related to the story of the Giants mentioned twice in the Torah in connection with Hebron. First in the very name "Kiryat Arba" which means the city of "Arba", the father of the giants. The second time they are mentioned, is in connection with the "Meraglim", the twelve spies sent by Moses. During their survey of the Land the spies encounter the very same giants in the vineyards of Hebron in the valley of "Nachal Eshkol". "Like grasshoppers are we in their eyes" is the way the spies describe their reaction to the giants they find. Their proof, which they brought back to the Israelite camp, was the giant bunch of grapes, which had to be carried by eight men. 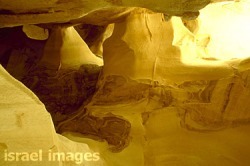 In fact, the huge man made caves of Beit Guvrin are located just west of Hebron in the hill country of the Sh’felah. However, the many visitors to the spectacular caves will read in the learned explanation offered at the site, that the bell shaped caves were in fact only quarries. Their soft chalk material was used for building purposes. We have here a clear case of denial of Biblical evidence. In the following, proof will be brought contradicting the quarry thesis. The very symmetrical bell shapes of the caves show clearly the chisel marks from the bottom going up to the small chimney which towers eighty feet above the precise geometric center of all the caves. The quarry theory claims that the work proceeded from the small chimney downward. It is not logical, however, that the material was lifted up and out through these small holes. If the purpose of the excavation of the caves was for building material, why were they excavated in such perfect symmetries? The very soft chalk is useless in forming building blocks. There are literally hundreds of the caves in the general area of Beit Guvrin. Many of them collapsed. Read more Israel Tourism articles at Arutz Sheva's Jewish Universe Travel page.